To reach our more remote sites you have to get up early. But few things are more magical than a calm Cambodian morning. 30 some kilometers north of Koh Sdach you will find a rocky island popping out of the middle of the ocean. The waters surrounding the island have amazing visibility all year round, and there is always lots to see on this site. The island got its name from the black tip reef sharks that live off the north west point. But also other species like bull sharks and whale sharks has been spotted here. The tiny, rocky island is home to thousands of terns and other seabirds, and you can hear the constant sound of wings and screams from these magnificent flyers. There are even four coco nut threes. 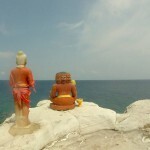 A small shrine was put up to protect the remains of the diseased from the Vietnamese ship that went aground on the reef about half a kilometer north of the island. The survivors from the shipwreck managed to swim to the island, but unfortunately they all died since no other ships detected the drama in time. For many years their skeletons and skulls were protected in the shrine, but are now removed. Next to the shrine is a flat area that we use as camp site on our overnight trips. 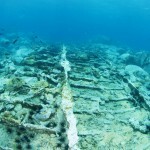 There are two main areas for diving. Around the island, or on and around the reef. 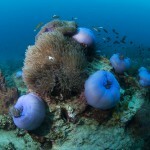 The terrain is made up of blocks of rock with corals and beautiful blue anemones all around. The area is an important fishing ground, and it’s interesting to see the fish traps in use. 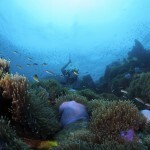 With an impressing number of reef fishes and pelagic fish this is a dive site you will remember for a long time. The area is big enough to spend some days exploring. Departure on demand. Minimum numbers of paying divers to depart: 2. For booking,please send us an email or call us. Please see our booking and cancellation policy here.